Our onsite store closed in 2018. However, here are just a few of the Farmer's Cow products you can find at local grocery stores like Price Chopper, the Big Y and Stop & Shop. See listing of retailers that carry Farmer's Cow. 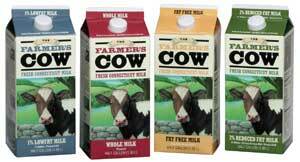 Milk: Whole Milk, 2% Reduced Fat Milk, 1% Low Fat Milk and Fat Free Milk, Chocolate Milk, heavy cream and Half and Half. Seasonal Beverages: delicious lemonade, and ice tea/ lemonade mix. Seasonal beverages are sweetened, but do not contain high fructose corn syrup. Ice Cream: Ten flavors and counting in pint containers.